In this section you will learn how to carrier unlock your iPhone running a variety of baseband (e.g. 01.59.00, 04.26.08, 05.11.07, 05.13.01, 05.12.01, 06.15.00) and firmware (e.g. iOS 9, iOS 8, iOS 7, iOS 6, iOS 5, iOS 4, iOS 3) combinations. Simply scroll through our how to unlock section for the iOS firmware you are trying to unlock, and follow one of our easy to follow how to guides using UltraSn0w, UltraSn0w Fixer and other unlocking solutions. Note #1: Your iPhone needs to be jailbroken in order to unlock it by using UltraSn0w or UltraSn0w Fixer. Visit iJailbreak’s How To Jailbreak section for all your jailbreaking how to’s, tutorials and guides! Note #2: We will be updating this page with the latest how to unlock guides when new baseband/firmware versions are released, so make sure you come back soon! Unlocking the iPhone is a process where the iPhone is modified to accept the SIM card of any carrier. Unlocking your iPhone is not the same thing as Jailbreaking your iPhone. When you Jailbreak your iPhone you are not unlocking it, rather opening it up to 3rd party tweaks and applications. For more information on Jailbreaking you can visit our Jailbreaking section. It is important to keep in mind however, that to software unlock your iPhone it is indeed required for it to be Jailbroken. If you purchase an iPhone on a contract then it is locked to that carrier until your contract runs out. This is usually for a period of 2-3 years. When you purchase an unlocked iPhone, meaning you pay the full price for the iPhone, then it can be used with any carrier and there is no-commitments in the length you must stay with that particular carrier. What you should be taking away from this is that there is no real middle ground. You either have a locked iPhone or an unlocked iPhone. Thanks to some workarounds however, it is indeed possible to unlock a locked iPhone. The first method to unlock an iPhone would be a hardware unlock (obviously out of scope for most people). At this time it is not possible to hardware unlock your iPhone. This entails actually modifying the internal components of your iPhone. When the original iPhone was released this was indeed possible, but long gone are those days. The next method for unlocking your iPhone is a software unlock. 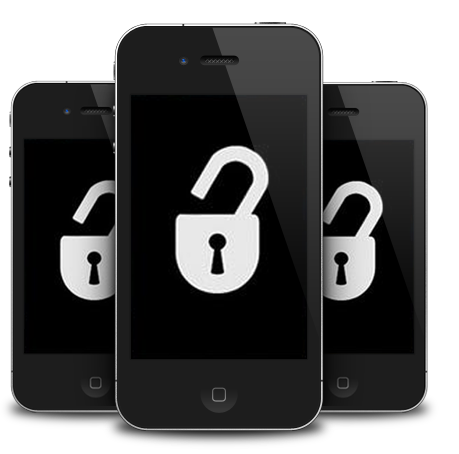 The two software unlocking solutions for the iPhone that are currently available are UltraSn0w and BlackSn0w. UltraSn0w was developed by a group of developers by the name of the iPhone Dev-Team, where BlackSn0w was developed by an individual by the name of Geohot. The only problem with software unlocks are that they require a Jailbreak and are only supported on a limited number of older baseband versions. Another method of unlocking an iPhone involves purchasing some sort of passthrough card or SIM interposer. When you purchase one of these special passthrough cards you will be required to place it between your SIM card and the baseband hardware (it essentially sits on top of your SIM card). In order to maintain this sort of unlock you must always keep the card between your SIM card and baseband hardware. This method of unlocking has become more popular because it supports newer baseband versions. Example’s of companies who create such passthrough cards include Apple N Berry and RSIM-7. The price of one of these cards is anywhere from $20 – $40. The last method for unlocking your iPhone is an IMEI unlock. Although this method of unlocking the iPhone is more expensive than buying a passthrough card/SIM interposer (it will run you anywhere from $50 to $200), it is more convenient. When you IMEI unlock your iPhone it is unlocked for forever and you can update to new iOS versions, without worrying whether it will effect your unlock or not. IMEI stands for International Mobile Equipment Identity and it is a string of numbers which Apple uses to categorize iPhone’s as lock or unlocked. When you purchase an IMEI unlock for your iPhone it is placed into the latter category. There are many online services available for IMEI unlocking your iPhone, which you can find yourself. Essentially you have three options when it comes to unlocking your iPhone. The benefits of a software unlocking solution are of course that they are free. The obvious downfalls included limited iPhone generation and baseband support, as well as the requirement of being Jailbroken. The Passthrough card/SIM Interposer method is indeed better because it supports newer generations of the iPhone and newer baseband versions, but it isn’t always compatible with new iOS firmware versions. If you can afford it the obvious winner here is the IMEI unlock as it is not limited to specific baseband or iOS versions. Unfortunately software iPhone unlocking solutions are no longer compatible with newer iPhone generations or baseband versions. If you happen to be in possession of an older iPhone with one of the compatible baseband versions shown below however, you can indeed unlock it for free. Keep in mind that if a new baseband exploit is found and one of these software iPhone unlocking solutions is updated we will update this list. Unlocking your iPhone with UltraSn0w or BlackSn0w is extremely simple and only requires your iPhone to be Jailbroken. For those of you that do not know how to Jailbreak your iPhone you can visit the How To Jailbreak Section. We have detailed how to guides for unlocking almost all supported firmware and baseband combinations. You can browse through the tutorials listed below or if you are more technically inclined simply add the repository for one of the software unlocking solutions (shown in the compatibility section) and then install the package to your iPhone. Step 2: Tap the “Manage” tab located on the bottom tab bar. Step 3: Tap “Sources”, “Edit”, then “Add”. You’ll be prompted to add URL source. Type “http://cydia.pushfix.info” and tap “Add Source”. Step 4: Cydia automatically refreshes and updates sources. Step 5: After Cydia is done refreshing sources. Tap the “Search” tab on the bottom tab bar and search for “T-Mobile US MMS Fix for iOS4”. 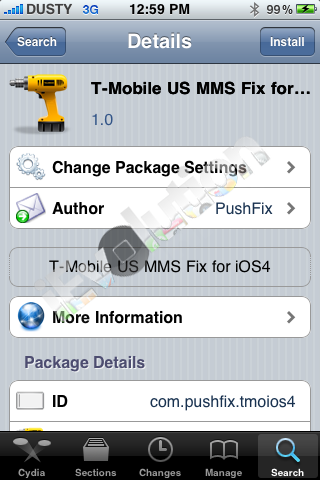 Once “T-Mobile US MMS Fix for iOS4” appears, tap and you should see version “1.0″. Tap “Install”. Volia! MMS should now be working. how to unlock my iphone2? theres no such thing as iphone 2 ! its called the original iPhone ! My iphone5c has been jail broken I’m not sure where to go from here help???? I have recieved an iphone 4s from a friend in US but it is locked with an itune inscription on it.How can i go about it? How do I unlock or re-program my iphone 5c to use with an alternative carrier? I am a CDMA customer in American Samoa. i have received iphone6 from my friend which is UK Vodafone carrier locked. All punters in india have given up in unlocking it. U have any solution…can u accept a challenge?? ?.